With its pioneering hands-on tools and interactive visuals, Multimedia Fluid Mechanics has revolutionized the way that people learn and teach the subject. Developed from the landmark first edition CD, we've let this top-notch teaching tool breathe and grow onto a DVD with twice the coverage. 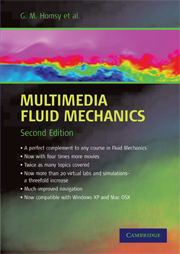 It now includes all the material for a standard course in fluid mechanics, uses higher resolution graphics and has more flexible part-screen viewing options. It features new modules on Turbulence, Control Volumes, Interfacial Phenomena, and Similarity and Scaling. It also has nearly 1000 fluids videos, more than 20 virtual labs and simulations and dozens of new interactive demonstrations and animations. To handle all this new material, the DVD (useable on PCs and Mac OSX) has much better search and browse, a chapter-by-chapter media library, and an electronic table of contents. You can even create movie playlists to move smoothly from one video to the next. 1. Kinematics; 2. Dynamics; 3. Interfacial phenomena; 4. Similarity and Scaling; 5. Boundary layers; 6. Turbulence; 7. Control Volumes; 8. History.